Florida Keys Attractions are fun, free, expensive and plentiful so where you should go to find the best guide to attractions throughout the Florida Keys? Well you certainly have come to the right place. As unlike so many of the stuff that you find on the web, we have actually been to the places, so its a real insiders guide for you. So what is that you're looking for? Perhaps its somewhere that can entertain the kids for a few hours? And really when it comes to the kind of things to do that kids will love IE Animal based, nature treks with experts, or even hands on museums and exhibitions then the Florida Keys has a great selection for you. My kids have got harder to please nowadays, and even though they crave to go up the road to Orlando and the big theme parks, I find that the keys attractions delight them just as much and of course do not cost anywhere like the same amount to get in. But perhaps your focus is on something to do with your partner, and with beaches to relax on, pubs and restaurants to go wild in, and some of the finest restaurants around then you can definitely get in their good books easily. Whether you want to splash the cash and hire your own cruiser for the day, letting others steer you effortlessly into the sunset, whilst the hardest thing you do is open another cold beer. Really the options are many and the choices are yours alone. So we will arrange the best Florida Keys attractions into sections, to make it easier for you to decide what to do first. And for many the idea of a totally free thing to do wins the day every day. So that is where we will start. Make sure you check back often, as we will be adding more places and things to do, as often as we can. Bearing in mind that these are the free stuff, we aren't talking about theme parks, and the tourists attractions that obviously everybody will want to visit whilst down in the Keys. These are the things that are off the beaten track, or simply unknown by many of the visitors who flock to the Florida Keys each year. But some of them are simply amazing that they are free to visit like the Eco-Discovery Center down in Key West. 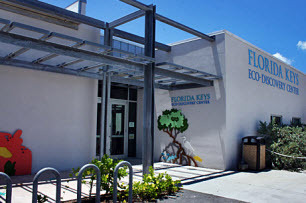 This place cost over $6,000,000 to build and is full of hands on exhibits, films to watch, and information about the Florida Keys natural habitat. It's really interesting stuff and well worth a visit. And then whilst we are down in Key West you could do the Pelican Path, which whilst not an official Florida Keys attraction is a great way to dive into Key West at your own pace. Grab an official copy of the Pelican Path map and then walk the streets seeing the best of what the place has to offer in regards to attractions, homes and museums. And these are just two of the kind of things that can fill your time. And most importantly not cost anything at all. So for further Florida Keys attractions that are free, click on the following ever expanding list of the best things to see and do that wont cost you a penny. Who doesn't really like an attraction that involves an animal or two? Hell, old Walt Disney made millions on just a mouse, and down in the Florida Keys we have a lot more animals than just a mouse. 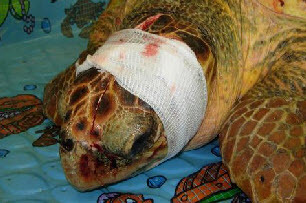 If you want to spend some time discovering how a injured turtle is nursed back to health before being released back into the sea, or how experts make an injured seabird take its medicine then we can fulfil both desires. The Turtle Hospital in Marathon has been open since 1986 and in that time has helped literally hundreds, perhaps even thousands of turtles make the trip back in to the sea after being hit by boats and stuff. The experts here open the doors daily and walk you through all the steps required to help these poor animals recover. And the same can be said in Tavernier at the FKWBC or otherwise known as the Florida Key Wild Bird Center. 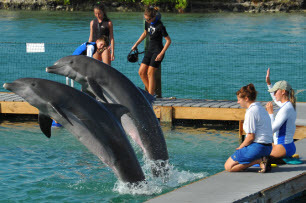 Both of these Florida Keys attractions are a must see, so do need a bit of planning and booking an appointment. But if you fancy just turning up whenever you want, then with our list of the best attractions to do with animals, then you will be more than catered for. The attractions that you will find down at the southernmost point of America Key West, are really a night and day kind of thing. You can start at the crack of down and peacefully watch the sunrise at some of the best locations on earth for doing this kind of thing, before undertaking a tour of museums, galleries, homes of the famous, and even the beaches that Key West has many off. After all this you may well need a drink, so the bars and restaurants that make Duval Street famous could well be your last port of call before bedtime. It is eclectic to say the least, and it is just that intoxicating mix of madness, fun and natural beauty that will have you following such luminaries as Edison or Ernest Hemmingway and even ex-president Harry S Truman who were all captivated by what the "keys" could offer. And really if you ask the thousands of people that visit the place each year, you will find very few people disagreeing with their appraisals. 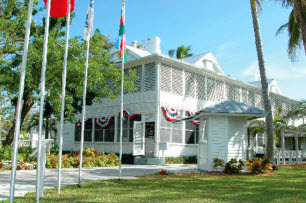 The Key West attractions are often cheap, sometimeslaid back, but certainly memorable. The Florida Keys attractions that you will find in Islamorada are less I suppose glitzy and formal than the Key West ones. Key West really caters for the tourists, whilst up in Islamorada the attractions and things to do are very much natural and quite often free. From grabbing a bucket of food and feeding the mighty Tarpon fish at Robbie's Marina In Islamorada, to exploring the historic site over at Indian Key you will get a flavour of the real Florida Keys. Now don't get me wrong Key West, does what it does very well, but I like the understated charm of Islamorada very much. So take a look at the 1935 Hurricane Monument, or visit the graves at the Pioneer Cemetery at Cheecha Lodge Islamorada. Have a picnic at Library Beach, explore the history of diving through the ages at the History of Diving Museum, or swim with the dolphins at The Theatre of the Sea. If you like Florida Keys attractions to be outside and low cost then our guide to Islamorada is the place to go. Whilst we are talking about things to do in the Florida Keys, it is worth mentioning the special events that occur each year. The keys has a great calendar of things going on each month with Art Under The Oaks in Islamorada being just one of the things in January, right through to the Boat parades that cover the keys in December. But these are just the small stuff, as major events such as the ladies only Womanfest in September and Fantasyfest in October, are the real island showstoppers that bring in the crowds like nothing else. A Few Other Florida Keys Attractions....Well Kind Of! Even our Bars and Restaurants have the...Florida Keys extra something and become Florida Keys Attractions. Take Sloppy Joes,the famous and infamous Key West saloon. This place started on December 5, 1933, the day Prohibition was repealed. And although it was simply a place for the locals to hang out, it grew through two name changes and a sudden change of location before it became what it is today - Florida's southernmost outpost. And when you do pay a visit make sure you try the sweet and cool Rum Runner ,the Rum Drink that is the key to lazy, relaxing hours in the Florida Keys. Isn't that what vacations are all about? But that does happen, and there is no better place than to waste a few hours than being in one the Florida keys Movie Theaters. Down at 907 Whitehead Street, just by the Key West lighthouse the world famous sportsman, fisherman, drinker....and oh yeah he wrote a few books too, Ernest Hemingway decided to set down his roots. And what better place to do it than right in Key West. So go and take a look at where he lived, and worked, and make sure you take a look at the weird six toed cats that still hang about. Seahorse Charters are for many the first number they call when they fancy going out onto the Florida Keys waters. If you have your own boat you can of course go out all by yourself, but these guys are experts and know just where the fish are. The Key West Butterfly conservatory is one Florida Keys attraction that can get quite busy, so the best time to go is first thing in the morning, or last thing at night. The place is quite beautiful with some of the largest species of butterflies that I have ever seen, although I couldn't say that they are the biggest around. Still check it out for an hour or so. If you make you way down to where all the cruise ships come into town, you will find yourself at Mallory Square. Do this in the evening as the sun is starting to set, and one thing is for sure. You will not find yourself alone. Since 1986 when the Turtle Hospital first opened its doors over 1000 turtles have been brought to the hospital and nursed back to health. Being a real life working hospital you may well see another visitor be brought in as you tour the place. In 1946 Harry S Truman, who was at that time the 37th President of the United states decided to come down south to get over a cold he was suffering with. Being told by his Doctor to find a stress free environment, he first entered what is now known as "The Little White House"
This is no more than a quick stop over, but its certainly one of the Florida Keys attractions that is great fun and quite cheap. Get yourself down to Robbies Marina buy a bucket of food for about $6.00 and then watch the giant Tarpon fly out of the water.